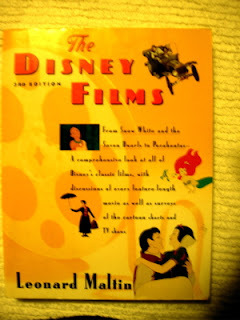 This is the book, "The Disney Films", by Leonard Maltin. This is the third edition of the book. It covers the Disney animated feature films, from "Snow White and the Seven Dwarfs" to "Pocahontas". It also gives "a comprehensive look at all of Disney's classic films, with discussions of every feature-length movie as well as surveys of the cartoon shorts and TV shows". This third edition was published in 1995, which was the year that "Pocahontas" was released in theaters. This book is a must-have book for anyone who wants to be an authority on Disney, with information about all the films that were made when Walt Disney was alive, and a lot more that were produced after his death. I still haven't watched all of the old classic non-animated Disney films yet, but I've seen most of them. This book is good for thinking of what new films to rent from Netflix or to purchase from Disney Movie Club.